The Motorola MOTOTRBO SL300 DMR portable radio. 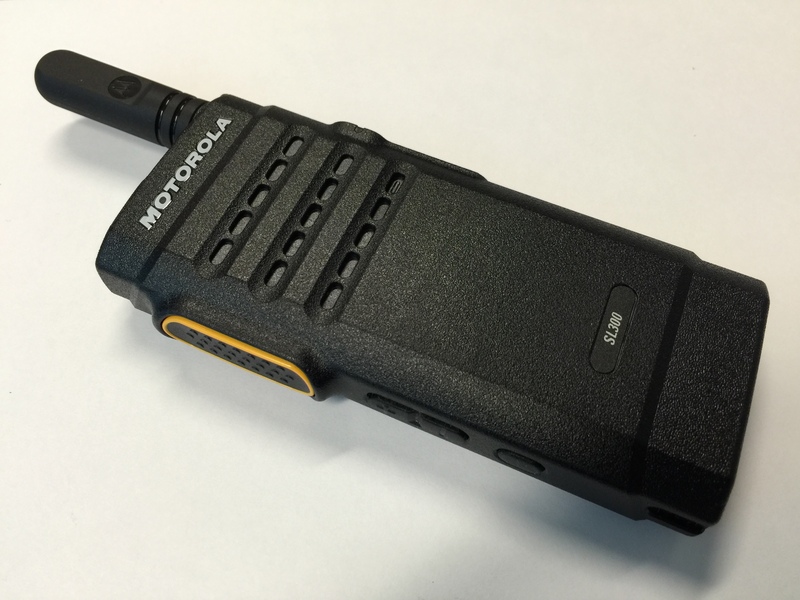 The Motorola MOTOTRBO SL300 is one of the latest additions to Motorola’s MOTOTRBO line of DMR radios. This unit is slim and light weight, making it ultraportable and a great shirt pocket radio for the ham that only needs a limited number of channels and limited battery life or low power operation. At the time of this review, the “ham friendly” pricing for a new SL300 from a Motorola dealer was $400 USD, which includes a 2-year warranty. Rugged Construction: This radio is very well built, being MIL Spec, so it should keep going long after typical ham radio units call it quits. 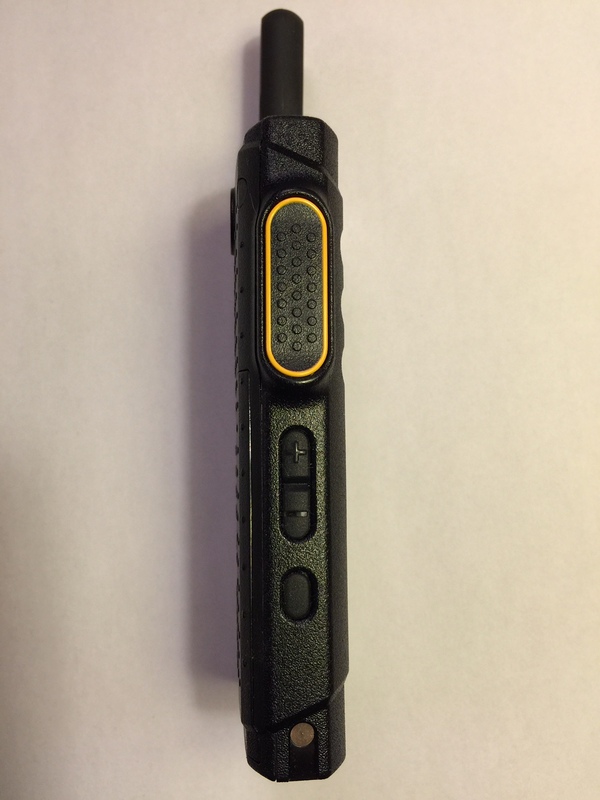 The SL300 is an ultraportable radio that is small, lightweight, has a great ergonomic design. Weighing only 169 g (6 oz) and being 22 mm (0.87 in) thick, the radio is easily one of the most portable DMR units on the market today. This radio fits nicely in the hand and can even be carried in a shirt pocket, making it a pleasure to use. In addition to its lightweight design, the radio seems well built, which is what one would come to expect from Motorola. The radio feels very solid and the accessories fit well, including the battery, antenna and the accessory port dust protector. 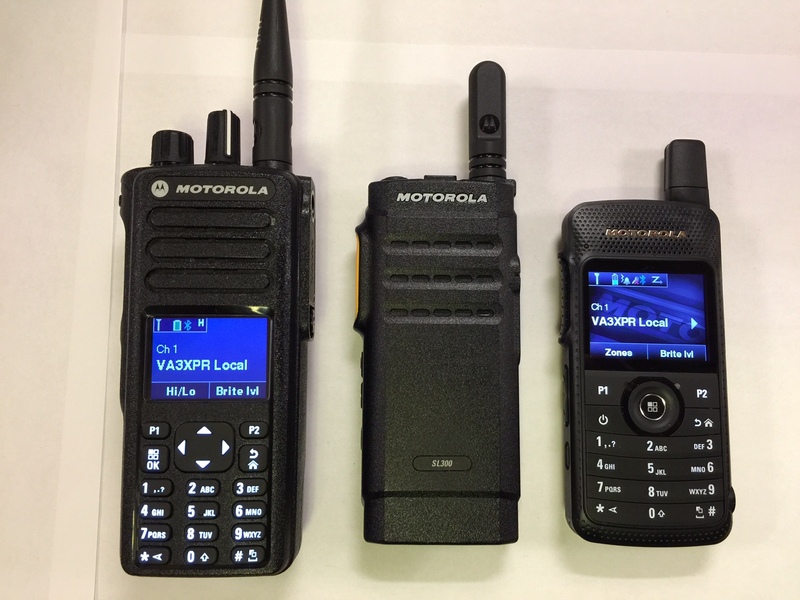 From the left, the Motorola MOTOTRBO XPR7550, the Motorola MOTOTRBO SL300 and the Motorola MOTOTRBO SL7550. In addition to a solid build quality, the the SL300 is able to endure harsh environmental conditions, including being water resistant, allowing it to meet the requirements of International Protection Rating IP54, making it more than suffice for typical ham radio use. 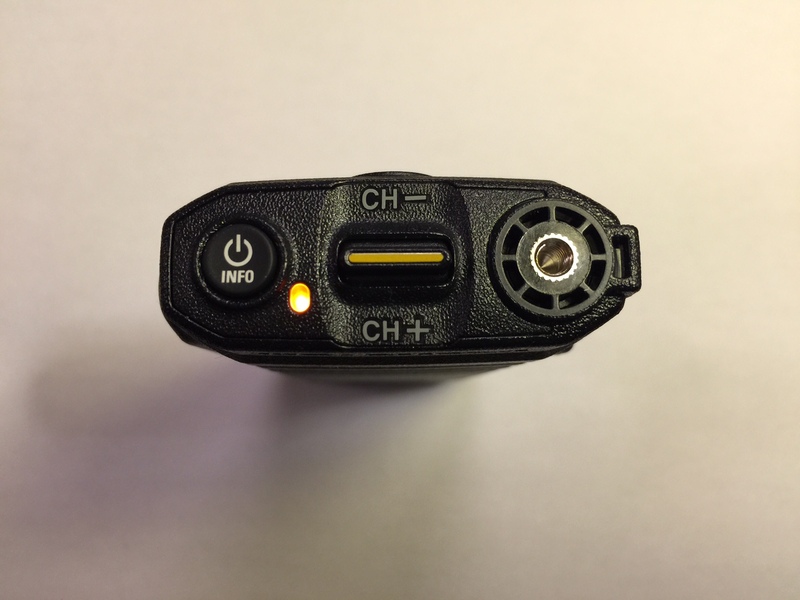 Unlike many other DMR radios, there are no knobs on the SL300, but rather four buttons and a toggle switch. These buttons include the PTT (push to talk), volume control buttons and a user programmable button on the side, plus a power button on the top. The user programmable button the side can be assigned by the user in the CPS for such functions as scan, zone select, etc. The toggle switch on the top is used to change the operating channel, either up or down. These buttons are made of high grip material, which will make them easier to use, given their small size. It is important to note that due to the size of the radio and its buttons, it would be difficult to use when wearing gloves or mittens. The left side of the Motorola MOTOTRBO SL300, showing from the top, the PTT (push to talk) button, the volume controls and the user programmable button at the bottom. The right side of the Motorola MOTOTRBO SL300, showing from the top, the audio accessory port and the power & programming port at the bottom. The top of the Motorola MOTOTRBO SL300, showing from the left, the power button, the LED status indictor, the channel toggle switch and the antenna connector. In addition, none of the buttons are backlit, so this may make radio challenging to use at night o dark environments. Also, the radio does not have a DTMF pad, so for users who need this functionality to control repeaters or for use with EchoLink or IRLP on analog FM repeaters, this radio may not be the right choice for them. The SL300 comes standard with either a stubby UHF or VHF antenna. The antenna connector used with the SL300 is a non-standard connector, which is much smaller than the typical SMA connector and may make connecting it to an external antenna difficult. 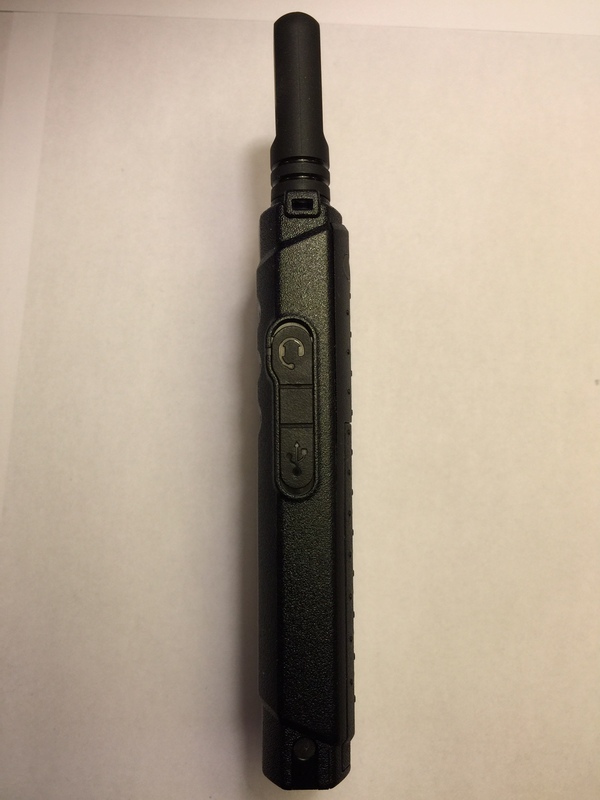 It is important to note that the antenna used on this radio is very small as compared to typical whip or stubby antennas used on other Motorola MOTOTRBO models, such as the XPR7550 or XPR6550. Motorola promotes this as part of its Range Max technology, which is intended to allow the radio to operate with a smaller antenna with minimal impacts to its usable range. 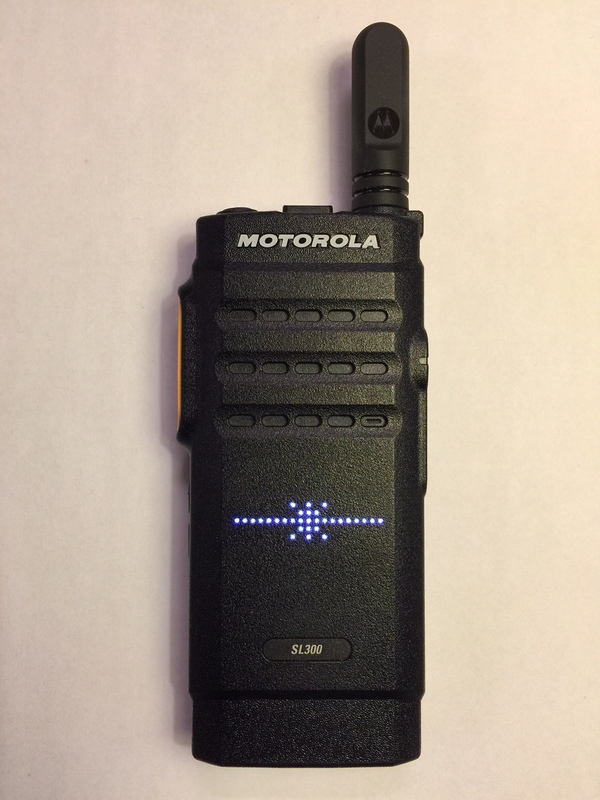 The usable range of this radio was tested and appeared be on par with other MOTOTRBO models, so it appears there is some merit to this claim by Motorola. One of the best features of this radio is its audio volume and quality, which is impressive for such a small form factor. Not only does the radio have loud, clear audio, but it also has a wide audio frequency response, providing good response to low audio frequencies. The rated speaker output from the vendor is 500 mW, so at full volume, this radio will be heard in noisy environments where many typical ham radio portables will be inaudible. The fullness of the audio is one of the best features of the radio, making it a very pleasing unit to listen to. With regard to microphone audio, the audio appeared to be fine right out of the box with good reports from other stations being received during test transmissions. The microphone audio level is adjustable in the CPS, so users can adjust it to fit their desired operating environments and preferences. It is important to note that the SL300 does not have Bluetooth capability, so use with Bluetooth audio accessories will not be possible. The SL300 employs an innovative display using a matrix of 19 x 5 LEDs mounted beneath the case of the radio, which displays such items as the current channel/zone, battery status, volume level, etc. This display is unique as it allows a limited display on such a small radio in a manner which protects the display from being damaged. Saying that, it does not display many of the other items normally found on MOTOTRBO radios, such as signal strength, the radio ID or name for received stations. In addition, when receiving a signal with the radio, all that is displayed is the talkgroup that is active, not the ID of the user transmitting. Another limitation of the display appears when changing channels, as the radio immediately displays the channel number (e.g. CH1) for a brief moment, then displays the channel name (e.g. VA3XPR Local). This combination make it time consuming to change channels, especially if the user is attempting to navigate through the 99 channel capacity of the radio. Supposedly, the radio is capable of a “fast toggle” feature, allowing the user to scroll through 10 channels at time, however since no manual was included with the radio an none is available for download from the Motorola website, this feature could not be configured or tested. The matrix LED display of the Motorola MOTOTRBO SL300. The SL300 also features a voice announcement, which provides an audible indication to status items, such as the battery status. Unlike the SL7750, the high end sibling to the SL300 that only supported UHF operation, the SL300 supports both UHF and VHF dual mode operation using either DMR or FM in analog mode. When in analog FM mode, the radio will support either 12.5 or 25 kHz channel operation. This will allow users to easily make the switch to DMR while continuing to allow them to operate using traditional 25 kHz FM, which is typical on ham radio FM repeaters. The RF performance of the SL300 compares specification-wise pretty much on par with most other DMR radios available on the market today. The transmit power of the radio can be set to either low power (1 W) or high power (3 W DMR, 2 W FM), but it not adjustable in terms of the values associated with each of these settings. The SL300 comes standard with a 3.7 V, 2300 mAh Li-ion battery (PMNN4468A), a 120 V micro USB wall charger (25009298001) and a belt clip (PMLN7190) and stubby antenna. The micro USB connection on the SL300 serves as both the power connection for charing the radio, plus the connection through which the radio is programmed. Fortunately for many hams, this radio can be programmed by using an inexpensive micro USB cable, which are commonly found at most computer stores. For users looking to charge their radio faster, a desktop charger (PMLN7109) is available, in addition to a wide range of audio accessories. It is important to note that unlike with other MOTOTRBO units, such as the XPR7550 and XPR5550, the SL300 does not include Bluetooth capability, so cannot be programmed via Bluetooth. AS it relates to battery life for the SL300, Motorola states that it should last around 14 – 15 hours with digital operation and somewhat less with analog FM operation . Through test the radio over the past couple of week, the battery life was found to be about a full day of usage on single charge. In order to fully realize the potential of this radio, one must have access to the MOTOTRBO CPS (Customer Programming Software) v10.8 or higher and a micro USB programming cable to configure it to your particular requirements and usage preferences. The MOTOTRBO CPS software allows many configuration options for the radio and almost every attribute of the radios operation can be controlled using it. Of course, with so many configuration options available, programming the radio can become very time consuming and difficult. Fortunately, the Help menus within the MOTOTRBO CPS help a great deal in explaining what the various options are used for. It is highly recommended that if you want to program one of these radios for ham radio use that you first consult with a professional who is familiar with the radio and the MOTOTRBO CPS programming software. For more information about programming this and other MOTOTRBO radios, check out some of the DMR-MARC website. There are some programming limitations that can be a bit annoying, specifically as it relates to the naming of talkgroups under the Contacts section. With the SL300, Motorola has limited the character length for contacts to four (4) characters, which can be problematic for ham radio users. As a result, users will need to become familiar with the talk group ID numbers in order to know which talkgroups receive traffic is originating from. For users who want to be able to program in 25 kHz channels into the SL300, which is standard with ham radio FM operation, they will need to have an Entitlement Key to unlock this feature, which are provided for free to users that have a valid CPS subscription.